Cheap In Price, High In Quality. Swarovski is the brand name for a range of precisely-cut lead crystal which is a particular type of glass. Swarovski Crystals are created through an innovative patented technology that increases light refraction which gives each crystal beads that brilliant sparkle. The lead content also increases the weight of the crystal as compared to normal glass. With swarovski's very strick quality control they have a rate of 98% accuracy to deliver the highest quality product. 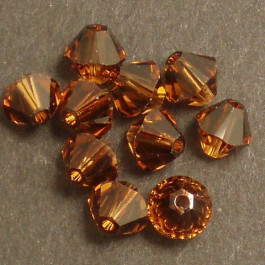 Authentic Swarovski Elements Crystal Bicone Beads Xilion cut is identified with style number 5328. With alternating small and large facets Xilion cut has an increased number of reflective surfaces on the familiar Bicone shape enhancing in brilliance. Order arrive very quickly today. Beads are excellent, much better than I expected for the price. Well done! I'll be ordering again. Hello, just wanted to let you know that I received my order today, after only placing it yesterday Very very happy customer once again! I would like to thank you for an amazing customer service I always receive when I order beads from you. I love the speedy delivery and quick confirmation email with tracking number. The beads are great quality and always as pictured. © 2019 Unigon Pty Ltd, Trading as Cheap Beads, All Rights Reserved. BN21966369. ABN:69 382 781 225.